What do 537 Franchisee’s have in common? The answer: They have all attended one of our overseas Millionaires Retreats as part of their franchise package. 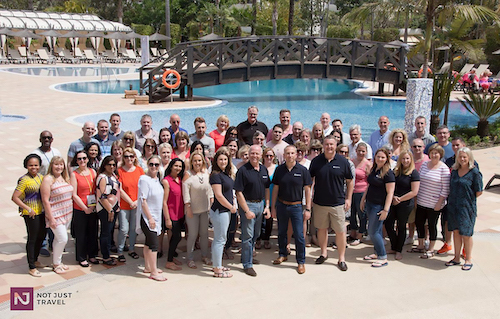 This week saw our latest Millionaires Retreat take place in the stunning resort of Club Med da Balaia, Portugal. A unique opportunity for our new franchisees to learn how to grow their businesses even bigger and better. Our Retreats are so good and so important we automatically give every new franchisee a place on a Millionaires Retreat, what’s more, they are 100% unique to The Travel Franchise. And we won’t add up how many drinks were consumed in the evenings! But what is The Millionaires Retreat? We recognise that 90% of people who invest in a franchise have never been self-employed before, never sold before and are first time entrepreneurs. When you start your new business, we teach you how to be a great Travel Consultant. The Millionaires Retreat is the next step. It is focused on how to be an amazing business person. We teach you the secret sauce for being super successful. Obviously, there is no magic pill for success, but we like to think this is the next best thing. Of course, we cover even more than this and it’s fair to say this is far more than you’ll ever get from a textbook or online video. Interacting with our other franchises, the founders, successful entrepreneurs and guest speakers is invaluable and a key part of the Retreat. No other franchises (that we are aware of) includes anything like this as part of their standard package. Remember: We only make money when you sell holidays, therefore it’s in our interest to do everything possible to help you become the best at what you do. What did our franchisee’s say about The Millionaires Retreat? Very motivational and inspiring Millionaire’s Retreat. A lovely hotel, great weather and good company. Amazing experience on the Millionaires Retreat! Would highly recommend It to anyone looking into the business! Having an amazing time at the Millionaires Retreat, lots of fab information and lightbulb moments with lots of laughs along the way! Currently on the Millionaires retreat. What can I say. Amazing experience and food for thought. Completely turned my business thinking upside down. Want to know how you could join us on the next Millionaires Retreat? Contact us today or access our special ‘Discovery Website‘ by clicking the button top right of this screen.